Beautiful 2013 Audi A7 3.0T Premium All Wheel Drive with Navigation System, 3.0L V6 Supercharged Engine, Power Moon Roof, and Premium Plus Package! Stepping up to the Premium Plus adds 19-inch wheels, front and rear parking sensors, a rearview camera, auto-dimming outside mirrors, a navigation system, an enhanced version of MMI, voice controls, keyless ignition/entry, a color driver information display and HD radio. All 2013 Audi A7 models are powered by a supercharged 3.0-liter V6 that produces 310 horsepower and 325 pound-feet of torque. 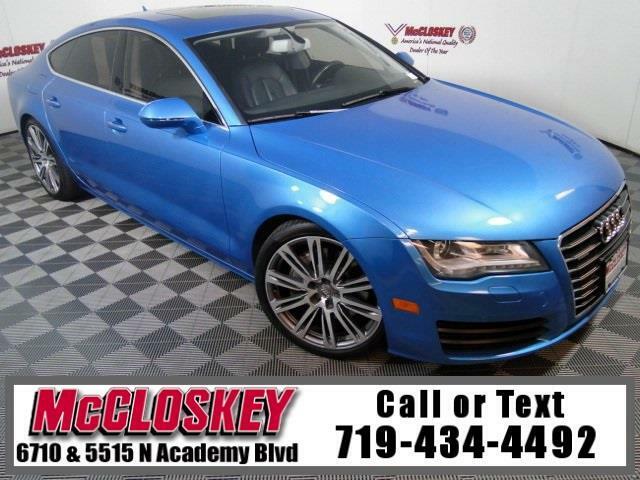 The 2013 Audi A7 is another showcase for Audi's excellent supercharged 3.0-liter engine. Low-end power is abundant and readily available thanks to the responsive throttle and quick-acting eight-speed automatic transmission. This engine also sounds fantastic -- smooth with just a hint of snarl -- and returns respectable fuel economy as well. This vehicle passed our 110 multi-point inspection and is backed by our National Quality Dealer of the Year Award. We are an ''A+'' Better Business Bureau Rated Business. We offer low interest rate financing, low down payments and the highest trade allowances in the state! Here at McCloskey we do things a bit differently, we shop our competition every day to ensure a great value to you. Come on down and experience it for yourself. This McCloskey Assured vehicle includes a 2 month/2000 mile Warranty and a Vehicle History Report!! At McCloskey we strive to provide ASSURANCE, TRUST, VALUE AND QUALITY! Call 719-434-4492.